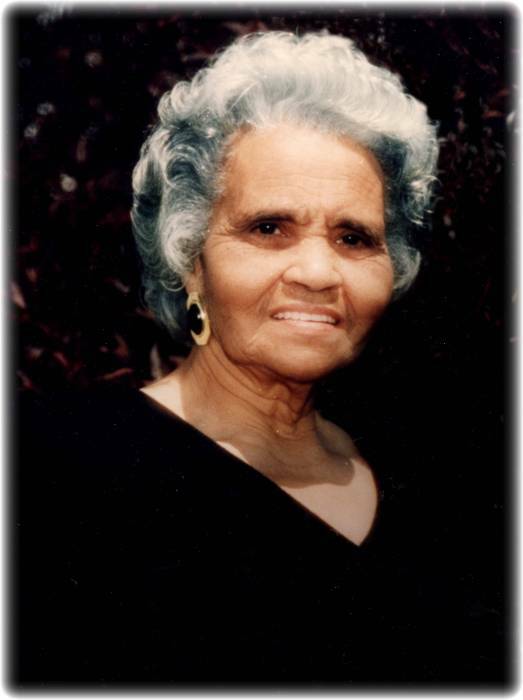 Obituary for Grace Thelma (Goins) Epps | Bill Head Funeral Homes and Crematory, Inc.
Grace Thelma Goins was born on January 17, 1921 to Oscar Goins and Birdie Brooks Goins in Kings Mountain, North Carolina. She had three sisters and two brothers; Eutha Goins Campbell, Creola Goins Mauney, Katherine Goins Boudreaux, William Oscar Goins and John Major Goins. Grace attended Lincoln Academy and graduated in 1938. She gave her life to Christ at an early age while attending Mt. Pleasant Baptist Church. After graduating from high school, she met and married John Edward Epps and to that union they became proud parents of eight children, five boys and three girls; John William Epps, Winston Edward Epps, Clayton Oliver Epps, Norman Reginal Epps, Iris Kerzell Epps Harris, Gayle Yvette Epps Monroe, Keith Aubrey Epps and Karen Birdie Epps Watson. In 1962, John and Grace moved their family to Los Angeles, California where she was a homemaker and raised her family. She moved to Stone Mountain, GA in 2008 to live with her daughter Karen Watson. She remained in Georgia until her death on January 31, 2019. Grace, known as Gavie and Mom, loved spending quality time reading her Bible and sharing verses with her children, grandchildren and anybody who would listen. Grace never met a stranger. She truly loved the Lord and GOD was an essential part of her everyday life. She was heavily involved in the community, always caring for others. Mom was loved by many for her selfless giving and looking for nothing in return. She truly inspired everyone to be their best. She was an amazing Mom, Grandmother, friend and spiritual adviser: Amazing Grace! On January 31, 2019, GOD called His angel home after a long visit on earth of 98 years. Her husband, John E. Epps; daughter, Gayle Monroe; father, Oscar Goins; mother, Birdie Goins; sisters, Eutha Campbell, Creola Mauney, Katherine Boudreaux; and her brothers, William Goins and John Goins preceded her in death. She leaves to honor and cherish her memory, seven children, John W. Epps, Winston Epps, Clayton Epps, Norman Epps, Iris Harris, Keith Epps and Karen Watson; twenty grandchildren, twenty six great grandchildren and one great-great grandchild; a host of nieces, nephews and dear friends. Her life taught us to love, give with joy, understand our own potential, forgive ourselves and forgive others. We celebrate Grace’s life and cherish her memories. Mom, enjoy the vision you had in the presence of the Lord, knowing that your life on earth certainly made a difference in every life you touched. Funeral services will be held at 2:00 pm on Saturday, February 9, 2019 at Mt. Pleasant Baptist Church in Bessemer City, North Carolina with Rev. Thurman Clark officiating. Interment will follow in Kelly's Chapel Cemetery, also in Bessemer City. Arrangements by Bill Head Funeral Homes and Crematory, Lilburn/Tucker Chapel, Tucker, Georgia (770) 564-2726 and Costner Funeral Home, 2425 W. Franklin Blvd., Gastonia, NC (704) 864-6787.